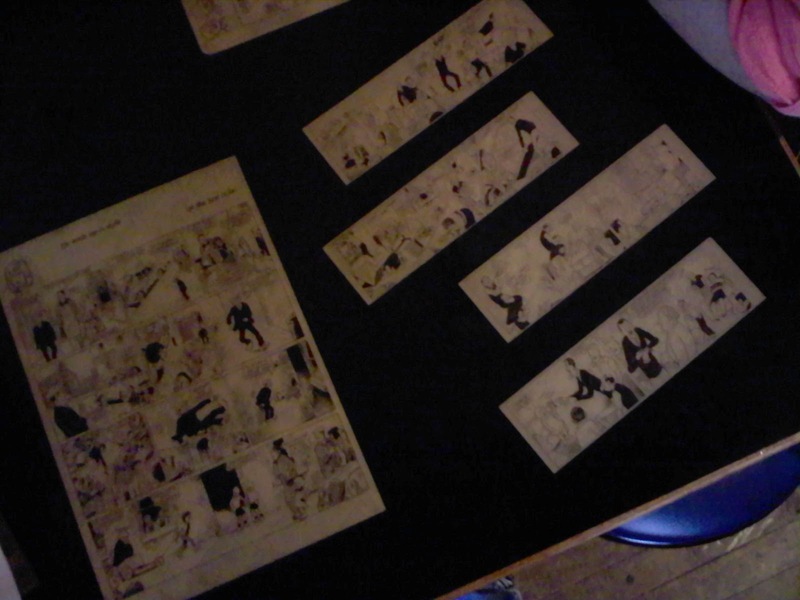 This photo with the really lousy lighting shows part of a tabletop that was découpaged with comic strips. We stumbled across it in a Scottish-themed restaurant/bar we went to last night. The table was actually large enough for four full pages and sixteen individual strips but, as far as I could tell, it was the only table in the place decorated like this. I wasn't familiar with the strip or even the style of the creator(s), and the pages didn't include any obvious mentions of the creators or even the name of the strip. But I did some digging this morning, and I believe it was a strip called The Broons, originally created by R.D. Low and Dudley D. Watkins in 1936. I didn't see any contextual cues to suggest when these particular pieces were written, and I'm not familiar enough with the artistic styles of the various artists to use that to date the pieces either. I don't really know much beyond the Wikipedia entry but I thought it was kind of a neat way to display some Scottish heritage in the restaurant itself, and a fascinatingly unexpected place to learn about some comics I'd never heard of before.